If you like the idea of mint for the holidays, but aren’t a huge peppermint fan, these are the cookies for you. For me, these are a nod to my Grandma. For as long as I can remember, my Grandma’s contribution to holiday dessert has been a box of Andes Candies. We’ve all come to expect them and holiday dessert is not quite right without them on the table. When I ran across this recipe that uses Andes chips, I knew Grandma would love them – and I just had to make them. In a stand mixer, cream together the sugar and butter until light and fluffy. Add in the eggs and vanilla and mix until well combined. In a separate bowl, whisk together the flour, cocoa powder, salt and baking powder. Add the dry ingredients to the wet in batches and mix until just combined. Fold in mint pieces. Roll dough into 1″ balls and place on parchment-lined cookie sheets. Bake for 8-10 minutes. Let cool on the cookie sheet for 5 minutes, then transfer to a rack to cool completely. 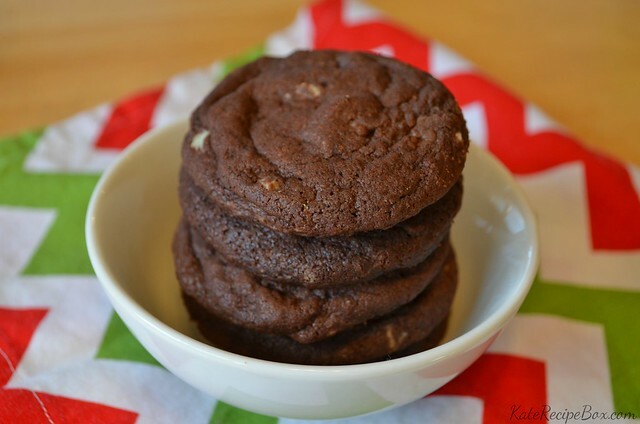 Love Andes mints and use them in my cookies quite often.